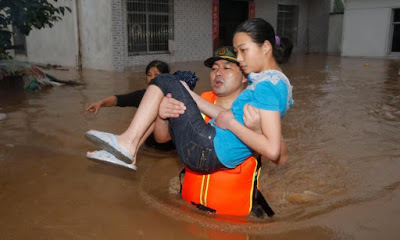 Lord, today we pray for China as its people continue to deal with the aftermath of this weekend’s flooding. One hundred twenty-eight people dead and more than 40 missing… Lord, it’s hard to imagine death by mudslide. We pray for the families of those 23 people who died that way, that the images would not haunt their dreams, that they would find peace in you. It’s also awe-inspiring to consider the power of rain. You have created rain as a good thing, yet it wrought so much havoc within China this weekend—flooding, the mudslide, a wall collapsing, etc. Lord, may we humble ourselves before you. May we honor you in all our ways. May we reach out to our neighbors in their time of need, as you want us to. I pray that your children in China would do this during this difficult time. May they comfort those who grieve, help and pray with those who lost homes or had to be evacuated. Bless the efforts of everyone trying to help. And may the missing be found as quickly as possible. In Jesus’ name we pray, amen.